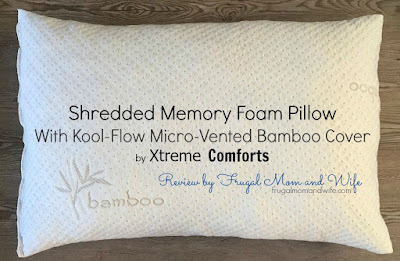 Frugal Mom and Wife: Shredded Memory Foam Pillow With Kool-Flow Bamboo Cover by Xtreme Comforts Review! Shredded Memory Foam Pillow With Kool-Flow Bamboo Cover by Xtreme Comforts Review! When your body does not receive the rest it need from a efficiant nights sleep you can suffer from many ailments. For example, Migraines, Insomnia, Snoring, Neck Pain and much more. A pillow can change so much about your sleep routine it's quite overwhelming. Some pillows collect dust and mites reaking havoc on your allergies. While others are lumpy causing your to readjust throughout the night. Some too flat and others to full. You shape the pillow to give good support but as the pillow collapses and heats up your support goes away which in turn puts stress on your nerves and causes you to wake up tossing, turning and flipping it to the cool side. Experience The Worlds Most Comfortable Pillow! Xtreme Comforts Shredded Memory Foam Pillow and Kool-Flow(tm) Bamboo Cover can help eliminate these problems! Everyone is different and likes their pillow shaped to their individual preference. Their pillow comfortably shapes to your head and neck in any position while maintaining proper support all night long ensuring you a better nights sleep. It will be the most comfortable pillow that you will ever own. 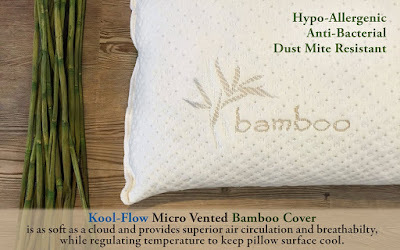 The Kool-Flow(tm) Bamboo Cover keeps your pillow cool all night long. 70% of people do not like their pillows and lose sleep tossing and turning because of them. Improper alignment of your neck cuts off the flow to your cervical nerves. With the Xtreme Comforts pillow you will get proper alignment of your cervical nerves which is essential for a good nights sleep. You will get more Rem sleep which is a deep healing sleep that keeps you healthy and alert. Below I have provided a short video to show you how the pillow comes package and what happens after opened. Since receiving this pillow to review I have noticed many changes in my sleep routine. Before I was using two pillows to try to get the job done. I have been through many pillow believe me and it's been no picnic. They seem like they are getting the job done but lose their body and I am reminded why I am always replacing pillows. I simply love how our memory foam mattress feels and how it bounces back after you get off of it. This pillow is made of just that but in shredded form wrapped in a bamboo cover. I have been in desperate need of a pillow that can help me put all the other pillows to shame until recently. I have always flipped my pillow over when sleeping just to put my face on the cool side. I have done this since I was little and have always said they need a cool pillow. What seems like forever and a day later here I am with a pillow that does just that. It keeps cool and hugs my head like it was meant for me. In fact, I love it so much I purchased two more for my daughter and husband. My husband no longer tosses and turns all over the place. He has a more rested sleep because of the lack of activity. Plus his seldom snoring has not been present since the pillow change. My daughter simply takes longer to get out of bed because she is so comfy. This is wonderful because her Autism makes it more difficult to not only go to sleep but stay asleep. Her new pillow actually helps her relax and drift of to sleep much faster it seems. I highly recommend these pillows by Xtreme Comfort from one wife, mom and Autism mom to another! This sounds perfect for my youngest, I always have to buy him airflow pillows so they are cooler for him during the night as he always seems to sweat alot, will definitely have to try these ones for him. This sounds like an amazing pillow indeed. I could sure use one of these and I love that it has the bamboo cover on it. Just totally amazing. Thanks so much for sharing.